UPDATE: Winner of the book giveaway is Cecil May, III … picked at random from those who entered. Thanks for reading and participating. 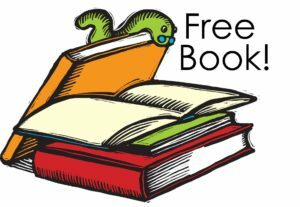 Another book giveaway coming soon! Thanks for checking out this blog post today. Be sure to read through the post to find out about a book giveaway! I can still remember being stunned beyond belief the day the phone rang in my office at Forsythe Church of Christ in Monroe. It was my friend Mark from the Mississippi Gulf Coast. He called to tell me that the wife and child of one of my best friends had been killed… murdered. Maggy and I began preparations to head down to the Coast to offer what support we could. Les Ferguson, Jr was living a nightmare, and we were helpless to do anything but tell him we loved him and would be there for him. Over time Les has chronicled his journey on a blog called Desperately Wanting to Believe Again. Nowadays the blog is titled simply, Les Ferguson Jr. Writes. And Les does write, he’s written a book called Still Wrestling. This book begins with a chilling account of the loss that Les and his family endured. In vivid and heartbreaking detail Les shares both what happened and his response in trying to deal with the many complications of this loss. Over the days, weeks, months, and now years that followed, I wrestled with God, wrestled with myself, and wrestled with my faith community. I am still wrestling. I suspect I will be wrestling as I draw my last breath. But this I promise: unless you have lost a child, you cannot comprehend the level of grief, pain, and suffering I am trying to describe. There is no going back for me. The hands of time cannot be rewound. All I know how to do is move forward. Sometimes bravely. More times than not, tentatively and fearfully. In my thinking, God wanted me to accept and serve something fundamentally different from the God I had known before. In the horror of tragedy, he wanted me to trust him. In the horror of tragedy, I was convinced he was unworthy. So, I ran. Yes, I have mourned the loss of me. The connections, the location, the friends, the life I once had. It all went away. And faster than you might believe. As it turns out, my tragedy simply shined a light on the brokenness that was already there. In most of the chapters, Les centers in on a Biblical character who has had significant life losses and struggles. In the retelling and examination of these stories we are reminded that though our losses may be different, the God who sees us through them is the same. But I see myself in each character. I feel his pain. I share the struggle. I am just as human as every person we’ve studied. … I am not alone. And neither are you. In the end, Les centers his faith in Jesus Christ. However, this is not a book that denies the ongoing pain of loss. I appreciate the way that Les balances out the pain and the faith that seem opposed to one another. I have fallen. I will fall again. But here is the good news: In Jesus Christ, I am more than the sum of my mistakes, failures, sins, and epic disasters. Because Jesus was and is the ultimate Savior, a day will come when my value and worth will be seen completely in him. That’s the Jesus I want to know. The Jesus who leaves you weak and trembling. The Jesus who unequivocally declares that love and service to others—even death on a cross—is what matters. It’s not our arguments. It’s not our differences of opinion. It’s not our posturing. None of that matters. It’s Jesus. Only Jesus. All Jesus. He is our doctrine. Everything flows from him. He is the invitation! Discussion questions follow each chapter, making it suitable for a small group or class. I read the Kindle edition which was excellent and performed perfectly. Ah, the giveaway! Thanks for reading this far. 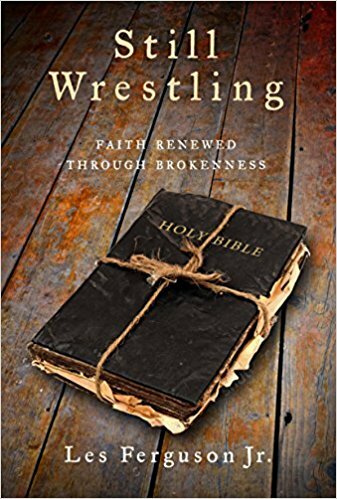 I’m going to offer one free copy of Still Wrestling to one reader of this blog. All you have to do is leave a comment letting me know if you’d rather have a paper copy or Kindle edition. I’ll choose from those who leave a comment in a week or so. I appreciate Les for bringing us along on a journey he never wanted to take. We don’t always get to choose our journeys but we do get to choose our Savior. No matter how hard the path seems, out here hope remains. I’d love a paper copy! I have never gotten the chance to meet Les in person, but I share some things with him: service to our country, as well as serving in the same branch of service; an appreciation for classic rock music; living on the gulf coast; attended a men’s retreat with Patrick Mead at the Gulf Coast Bible Camp (a.k.a. GCBC) and not knowing that Les was there until years later when I reviewed a pic of me and Patrick and Les is in the background; being a receptor of the Loving Grace and Mercy of our Loving Savior. however I have never suffered a loss such as his. I know that reading this book would be hard, but I think that if I were to read his book I would gain from his insights that he shares with the reader. I would be grateful for a paper copy John, if such were to come my way. Thank you for your encouragement. I would love a paper copy!!! Aren’t we all wrestling on some level? Hi. I would love a paper back book. It will be an honor to year Les’ book. Would love a paper copy!